Today is all about getting crazy because today we've bought you something that will blow your brains out. 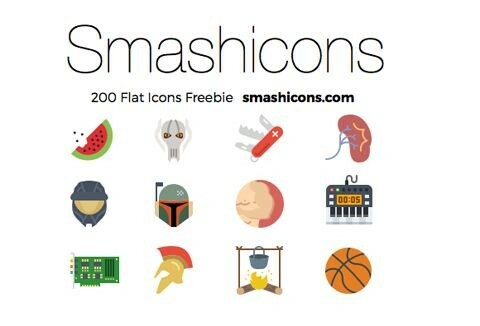 From the world's largest collection of flat icons - Smashicons with over 14000 icons, we've got you the chosen 200 free flat icons. You'll find a high versatility in this icon set as these icons were handpicked and not taken from any 1 specific category. Grab these amazing free flat icons today! You can use these free flat icons for your personal, professional, internal, editorial and client projects including printed materials, advertisements, packaging, presentations, video, on-line, computer games and applications or multimedia projects. You have the non-exclusive, non-transferable, non-sub licensable right to use the Licensed Material for 5 (five) clients or applications, commercials projects or in any allowed media. Making modifications or alterations to the Assets (changing the color, size, orientation and shape), but this does not allow you to sell or license them. You cannot resell, redistribute these icons. You will get detailed license agreement document with deliverable. DealFuel have been granted 30 exclusive coupon codes for 50% off any license when purchased directly from Smashicons. Use coupon code: DEALFUEL50. Hurry there are 30 codes available, first come, first serve! Ready to grab this set of 200 free flat icons now?